Is there such a thing as Christian hacking? The organisers of Code for the Kingdom, a 48 hour hack day with cash prizes, certainly believe so. Last month, almost 150 people gathered in San Francisco for Code for the Kingdom, a hackathon that gave away $11,000 in prizes to teams developing Christian projects. The event also offered networking opportunities with Christian organisations and a team of 15 mentors that included VCs, religious leaders, and senior employees at major American tech companies. Projects focused on social organising, fundraising, social reading, quantified self, content filtering, and open data. Although many readers of this blog are not religious, many of you know that one of my interests is to create more space for creative technology making within Christianity. In 2011, I organised a hack day in Cambridge UK that brought together Christian social technologists, game designers, and chip developers to imagine technology ideas in conversation with our faith. Last summer, I started blogging about the intersection between faith and technology. I have written about Christian transmedia marketing campaigns, data on preaching, and the emergence of prayer metrics. 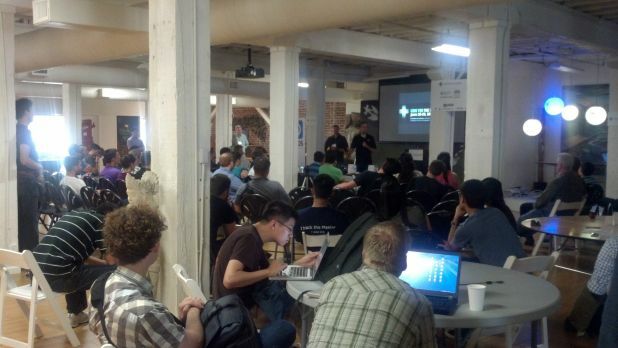 So when I heard about a Christian hackday in San Francisco, I was eager to learn more. Religion and computer software have a long and rich history, so what makes this different? Christian technology is already created by larger brands that translate and distribute religious texts (with related DRM software). Some Christian companies do content filtering, and smaller businesses sell software for church organisation management. While Christian music and content businesses are very visible and Christian social media outreach organisations are thriving, Christian app makers are less prominent. That may be changing, thanks to a mix of TED-like events and VC funding that is starting to emerge within evangelical Christianity. These events provide new channels for creative ideas to be heard within the faith, where academics, designers, coders, or businesspeople are rarely given a platform. Q Talks curates talks on “ideas for the common good.” Praxis Labs is a startup accellerator for Christian entrepreneurs “who are compelled by their faith to advance the common good.” Like these other organisations, Code for the Kingdom brings together energetic Christians to imagine and prototype ideas for Christian technologies. Code for the Kingdom brings a distinctively Silicon Valley angle to Christian tech. Its mentors and judges include a partner at the VC firm Andreessen Horowitz and Google’s head of Android partnerships, alongside more conventional mentors from charities and content companies. Reaching out to “techies, designers, and entrepreneurial starters,” organisers invited participants to “tackle the challenges confronting our society, our churches, and our spiritual lives” with “prayer and technology.” By holding an event, they are convening interest around this vision. By giving away $11,000, they are offering a small number of teams the possibility to start creating their idea. Hack day prizes are a new idea within Christianity, where funding models often rely on complicated church politics or access to the mass market Christian media industry. Christians understand how to give to our churches and charities. We are used to giving money to record companies. We’re not used to supporting creative people with energy and vision who don’t already know how to work within church politics. Code for the Kingdom may change that. Think of Spiritual Formation as technology for behaviour change. This category has strong overlap with personal informatics and the quantified self movement. Technologies for individuals and their peers fit here. The Stronger & Healthier Ministries category focused on supporting existing communities and institutions. Think of this as technology for organising, engagement, and fundraising. The Social Justice category is less easy to distinguish. Think of it as the charities and activism category. Likewise (@hellolikewise) (best overall) is a peer mentorship system for spiritual life. In their demo, the team also talked about linking people based on experience and skills. For example, it could connect prospective adoptive parents with people who have successfully adopted. Free As Me (best of social justice) is an app that helps people send tips to police about human trafficking, inspired by the work of the International Justice Mission to inform and support police raids around the world. The app would use GPS data, photos, and audio recording to send reports directly to people who could respond. Abide (best of Spiritual Formation) is an app to “share the gift of prayer,” that reminds people to prayer and creates a “prayer mode” for your phone so you don’t get interrupted by notifications while focusing on spiritual activity. Plus Bible (plusbible.com) (best of stronger & healthier ministries) is a social reader for the Bible. Using this app, you can share notes on religious texts with your friends. I’ll Join You (best new code) (@shamike2009) is an online meeting space for Christians. The app supports stronger, healthier churches and offers a space for leaders to find out what people in ther community might ordinarily feel too shy to mention. Unique Giving is a site that helps church plants (think of them as the church version of startups) create fundraising campaigns. Sproutlook is an app for mobile email for kids, with parental oversight and protection. This messaging system would incorporate drawing and audio tools. In addition, a parental moderation app would allow parents to approve incoming and outgoing messages. A group from the RealitySF church in San Francisco developed an idea for software to coordinate spontaneous social events. Scriptive is personal tracker and mood mapper that reminds Christians to read religious texts throughout the day. Stars & Stones is a site that lets you note spiritual moments (stones) and promises (stars). These can be played back or set up as reminders. IMDBible offers character profiles and datavis on people and names appearing in the Bible. Adopt a Building is a site where Christians can create challenges and coordinate on carrying them out asynchronously. Omegazones (by 4kWorldMap) is a project to create a schema and an API that Christian orgs can use to share spiritual data with each other. “Using population, existing political divisions, and availability of the Gospel as factors to create a mapping framework.” The organization offers “training, prayer tools, and various map resources to help Christian workers to strategize and mobilize. In his book From the Garden to the City, John Dyer argues that if society and technology shape each other, then Christians need to be attentive to the creative possibilities of technology as we try to live out our faith. By bringing together businesses, churches, and charities to a single hack event, Code For The Kingdom has curated a diverse vision of the directions that this creativity might take. Internet technologies designed with explicitly-Christian values may increasingly play a role in Christian’s personal behaviour, community life, and interventions in society. Participants in this hack day focused on social organising, fundraising, social reading, quantified self, content filtering, and open data. One notable absence in this list is the lack of apps about evangelism. Evangelicals are famous (notorious?) for our enthusiasm to spread the Christian message. None of these apps addresses that part of Christianity. Maybe it just feels too awkward or inappropriate to spread the faith with an app (“conversion rates, anyone?”). But it’s surprising that not one of the projects addressed this area. Perhaps those conversations just tend to happen more at the intersection of Christianity and transmedia marketing. Code for the Kingdom illustrates a growing trend among Christian makers to reflect on the values of the socio-technical systems around us and remake our digital environments with Christian values. “Program or be programmed” seems like an old cliche, but it’s an important perspective that Christians are acknowledging in new, creative ways. I’ll be fascinated to watch further developments. What do you make of this event? Share your thoughts in the comments. Previous post Going to Data Camp!